If you're thinking of purchasing an outdoor structure from Homestead, we'd love for you to come for a visit and see for yourself the quality and care we put into all of our buildings! We understand that buying a pool house, shed, or garage is a pretty big investment and we'd love a chance to show you why you should place your trust in us! In a world of buying and purchasing over the phone or online, nothing quite compares to meeting face to face and getting to know the people you're doing business with! We've had customers come from as far as Massachusettes and North Carolina to visit our shop, watch the construction process, and tour our buildings for themself. Located on a working Amish farm, there are plenty of reasons to come out and visit Homestead Structures! Tour the shop to see Amish craftsmanship and quality in action. Get to know the skilled and friendly team who will be handling your project. See our products in person so you'll witness the high standards we set for our structures. Tour the farm and help with farm chores such as feeding (and petting!) the animals and gathering eggs. Bring your children along to play with puppies (there are new litters several times a year)..
Stay overnight in our authentic guesthouse, styled after traditional Amish bed and breakfasts. Enjoy a snack and free gift on us. These are just a few of the reasons we'd love to come have you visit our facility! Call 877-272-7252 to schedule a time to come out and chat. We're available Monday thru Friday from 7A to 4P (after 4P by appointment) and Saturdays by appointment. The Homestead Guesthouse: Come Enjoy the Amish Life! Our homestead includes a guest house so you can enjoy a stay on an authentic Amish farm! 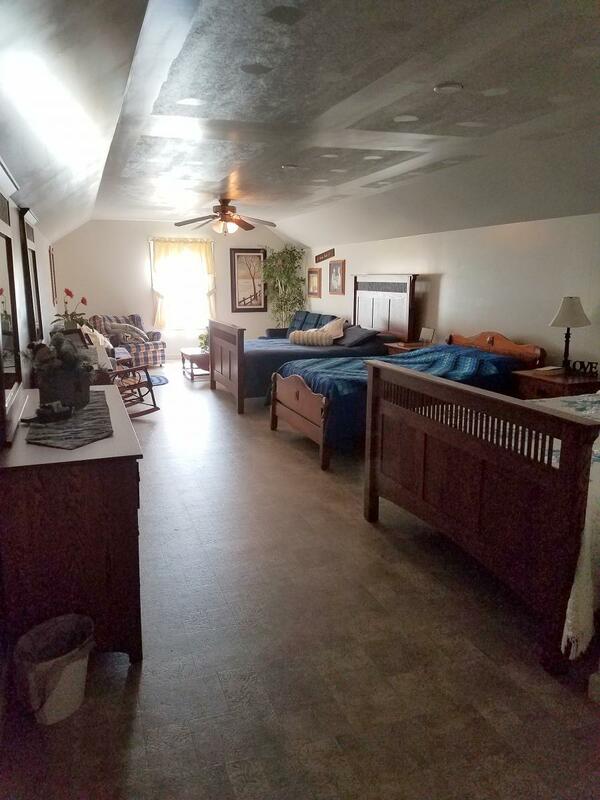 Whether you're coming to order your new pool house or shed, or you're just looking for a place to stay in Amish Country to enjoy our various attractions, the Homestead Guesthouse is a wonderful option. Gather eggs from the hen house. We'll even let you muck the horse stalls if you really want to! Enjoying an authentic Amish breakfast OR dinner with all the fixins'. Taking a leisurely horse and buggy tour, or letting the kids ride a minature horse. Touring Kitchen Kettle Village to experience Pennsylvania Dutch shopping with over 40 specialty and food shops. Visiting Shady Maple to enjoy their famous smorgasboard, Gift Shop, and Farm Market. Taking the kiddos for some excitement at Dutch Wonderland theme park. Visiting downtown Lancaster and emersing yourself in urban artisanship. Checking out your favorite outlets shops at Tanger and Rockvale outlets. Visiting Strasburg railroad if you have any train enthusiasts with you. Exploring a variety of nature parks, playgrounds, hiking trails, and waterways all over Lancaster county. Getting a taste of the wild with a guided tour through Lancaster county's very own Wolf Sanctuary. Stopping right down the road to Lapp Valley farm for some of the best ice cream and chocolate milk you'll ever taste! Driving the picturesque country roads and enjoying the views of sprawling farmland offset by lovely rolling hills of woods. Book your stay at the Homestead Guesthouse today! Call 877-272-7252 for more information or contact us here to discuss your new pool house, shed, or garage project and get an estimate!